Ipatovo kurgan refers to kurgan 2 of the Ipatovo Barrow Cemetery 3, a cemetery of kurgan burial mounds, located near the town of Ipatovo in Stavropol Krai, Russia, some 120 kilometers (75 mi) northeast of Stavropol. With a height of 7 meters (23 ft), it was one of the largest kurgans in the area. It was completely investigated in 1998–1999, revealing thirteen phases of construction and use, from the 4th millennium BCE to the 18th century. The first grave may have been a burial of the Maykop culture, which was destroyed by later graves. The earliest extant grave contained two young people, buried in a sitting position, dating to the late 4th millennium. On top of the kurgan was a Sarmatian grave of the 3rd century BCE. A woman had been buried here in extended position on the back, together with an exceptionally rich treasure of grave-goods: six solid golden necklets, two golden spiral bracelets, two golden finger rings made from Hellenistic coins, a gilded wooden cup decorated with zoomorphic figures, a short sword with gold-decorated pommel (the presence of a weapon in a woman's grave is not an unusual feature in Sarmatian contexts) and a gold-covered scabbard, a sheet gold buckle, a gilded wooden cosmetics container, and clay vessels. In the final phase, over one hundred simple graves were dug into the southern slope of the barrow; probably 18th century burials of the nomadic Turkic Nogai people. 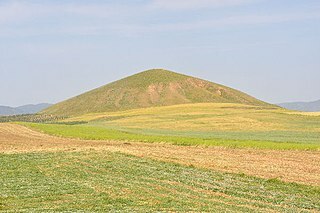 A tumulus is a mound of earth and stones raised over a grave or graves. Tumuli are also known as barrows, burial mounds or kurgans, and may be found throughout much of the world. A cairn, which is a mound of stones built for various purposes, may also originally have been a tumulus. The Black Grave is the largest burial mound (kurgan) in Chernihiv, Ukraine. It is part of the National Sanctuary of Ancient Chernihiv and is an Archaeological Monument of national importance. The Taplow Barrow is an early medieval burial mound in Taplow Court, an estate in the south-eastern English county of Buckinghamshire. Constructed in the seventh century, when the region was part of an Anglo-Saxon kingdom, it contained the remains of a deceased individual and their grave goods, now mostly in the British Museum. It is often referred to in archaeology as the Taplow burial. Burial in Early Anglo-Saxon England refers to the grave and burial customs followed by the Anglo-Saxons between the mid 5th and 11th centuries CE in Early Mediaeval England. There was "an immense range of variation" of burial practice performed by the Anglo-Saxon peoples during this period, with them making use of both cremation and inhumation. In most cases, the "two modes of burial were given to both wealthy and ordinary individuals", and in many cases were found alongside one another in the same cemetery. Both of these forms of burial were typically accompanied by grave goods, which included food, jewellery and weaponry. The actual burials themselves, whether of cremated or inhumed remains, were placed in a variety of sites, including in cemeteries, burial mounds or, more rarely, in ship burials. The Trumpington bed burial is an early Anglo-Saxon burial of a young woman, dating to the mid-7th century, that was excavated in Trumpington, Cambridgeshire, England in 2011. The burial is significant both as a rare example of a bed burial, and because of the ornate gold pectoral cross inlaid with garnets that was found in the grave. Klin-Yar is a prehistoric and early medieval site in the North Caucasus, outside of Kislovodsk. It was first discovered in the 1980s. Archaeological excavations had uncovered settlement traces and extensive cemetery areas starting in the 8th century BC, belonging to the Koban culture. The site was used up to the 7th century AD. Its long use over all this period, its size and rich finds, as well as the data quality of recent excavations make Klin-Yar one of the most important archaeological sites of the region.